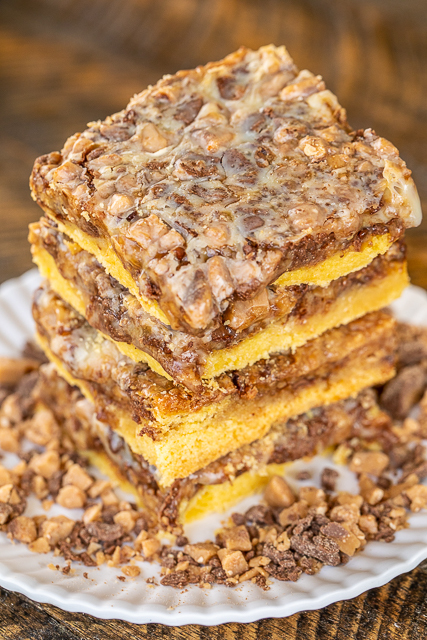 Need a last minute holiday dessert? 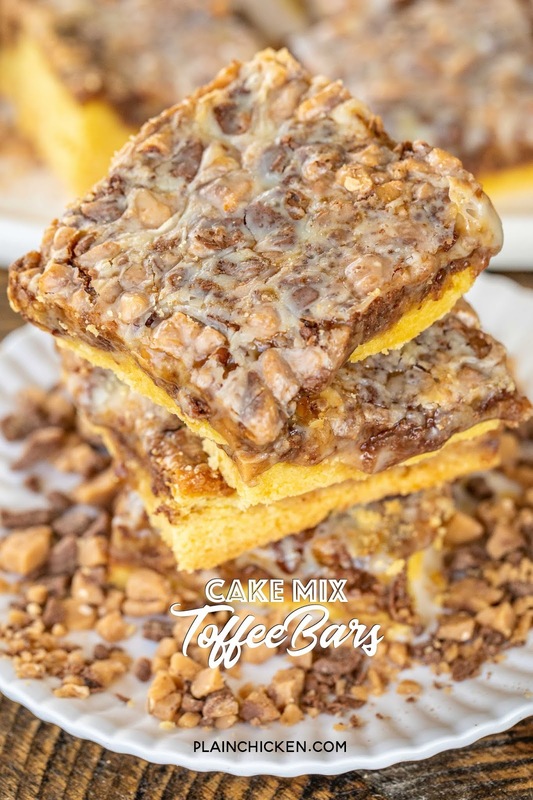 These Cake Mix Toffee Bars are the perfect last minute dessert! They only have five simple ingredients and are a snap to make. I had the bars ready to bake before my oven had preheated. 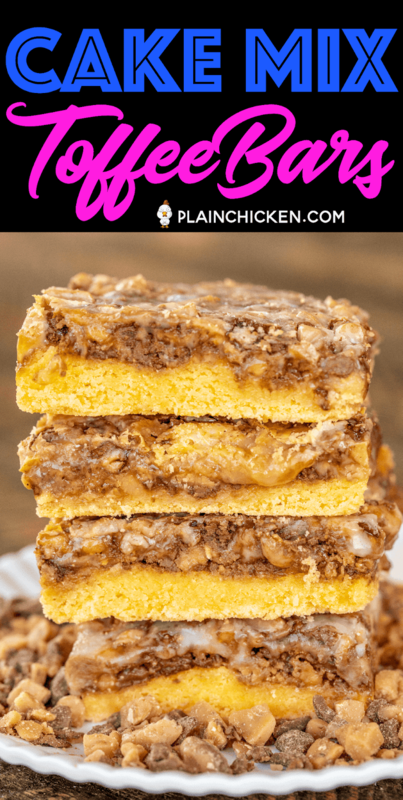 LOVE quick and easy desserts like this one! 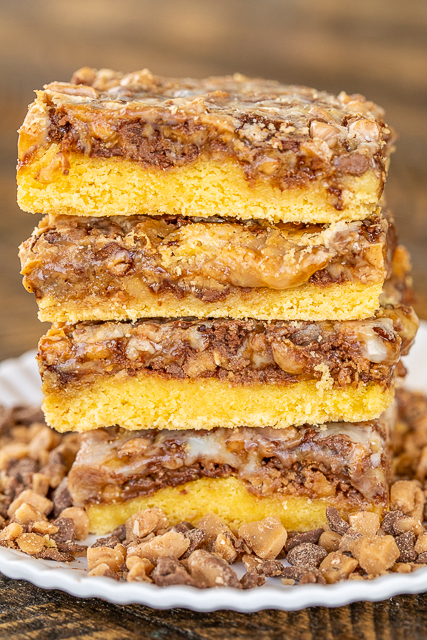 These bars are best if you can make them a day in advance. I like to refrigerate them so they set up and aren't too gooey. 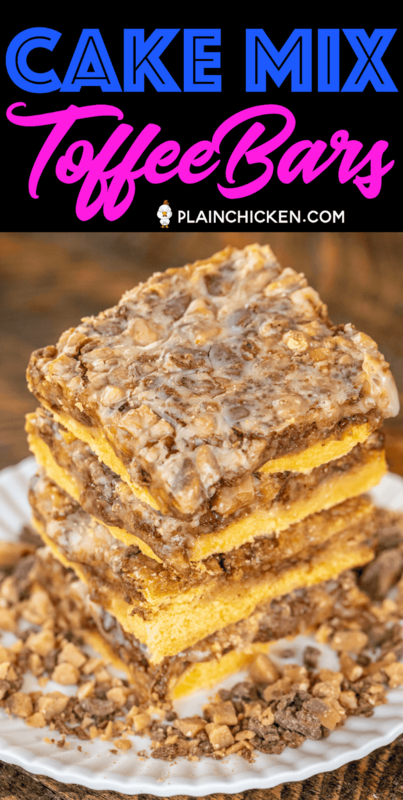 Waiting to dig into these yummy Cake Mix Toffee Bars is really the hardest part of the whole recipe! 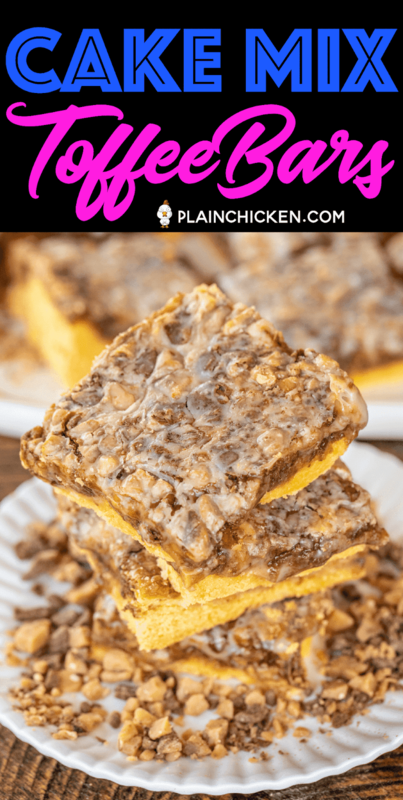 These Cake Mix Toffee Bars are great for any last minute holiday parties, potlucks or homemade gifts. These bars are pretty rich, so I cut them into at least 24 squares. You can make them bigger or smaller according to your personal preference. Chicken Legs prefers about 8 bars for the pan - LOL! I am whipping up another batch this week! SO good! Combine cake mix, butter and egg. Press into bottom of prepared baking dish. Sprinkle chocolate toffee bits on top of cake mix mixture. 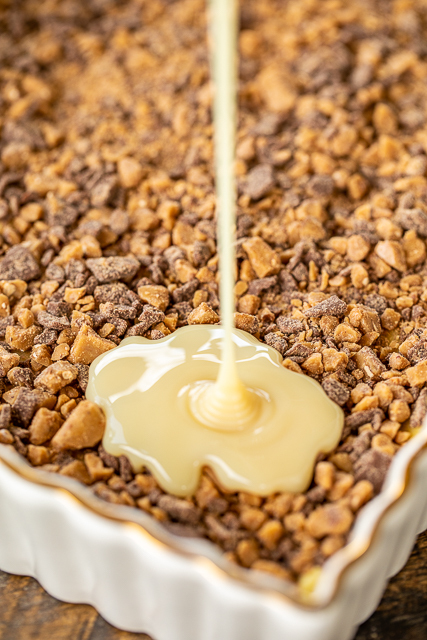 Pour sweetened condensed milk evenly over toffee bits. Bake for 25 to 30 minutes. Cool completely. I was looking for something new to bring to my work Christmas party and this recipe showed up in my email. I can't wait to make it, it looks so good!!! Ooo! I'm not much of a baker so these seem totally doable! Yum! Can you freeze these? Thanks! I haven't tried freezing them, so I am not sure how they would taste after thawing. That being said, I don't see why you couldn't freeze them. Have you tried this any other flavor cake mix, like chocolate? Hi! 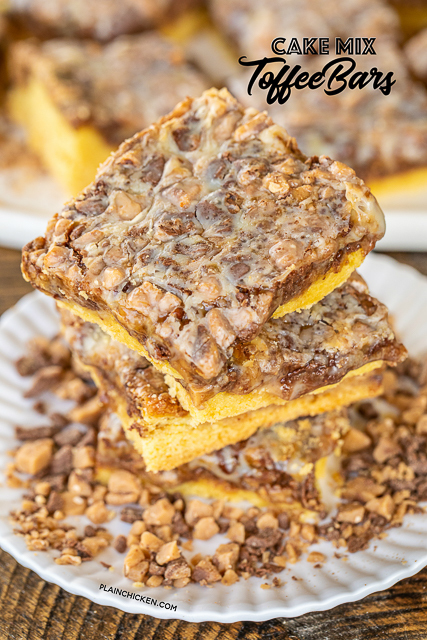 I haven't tried this version of these bars but make something similar and they are so yummy! 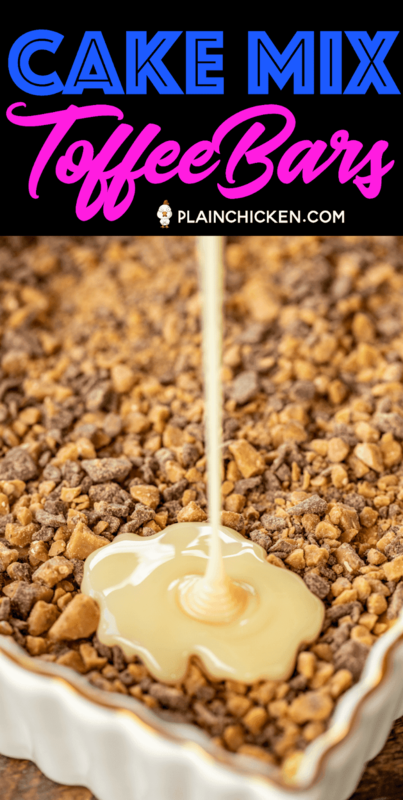 My recipe doesn't use an egg, and I use the plain toffee bits without the chocolate. I've always wondered how the chocolate covered ones would work. Can't wait to try them. And I have frozen them and they taste just fine once thawed. Hi! I’m wondering if the egg is in addition to the 3 eggs/oil/water that the boxed cake mix calls for? Am I doing the boxed cake mix first, and THEN adding in the egg and butter? Thanks! NO! Only use the ingredients listed above. You are using just the dry cake mix.